Noble indipendent house (300 sqm), in the historical center of the medieval village of Radicondoli. All kind of shops (postoffice, bank, bancomat). 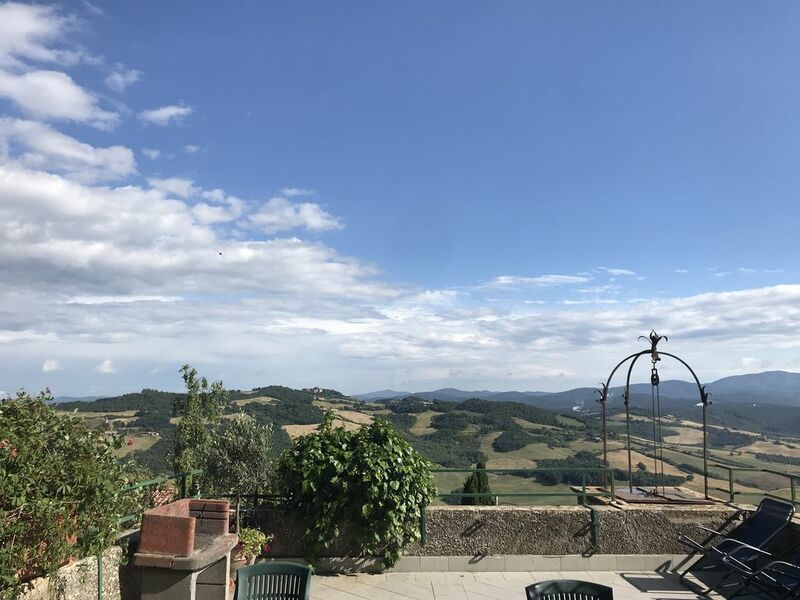 One side of the house faces the village, the other side has a marvellous and peaceful view over hills and valleys with a large panoramic furnished terrace of 45 sqm with barbecue and private, not shared, swimming pool. The house provides 4 comfortable double bedrooms and a smaller single passthrough, 4 full bathrooms with shower, 3 living room with fireplace, and a large well equipped kitchen with fireplace to cook. 3 living room, 2 of them with fireplaces, 2 of them with double sofa bed. The 45sqm large terrace panoramic on the hills is equipped with table and chairs, sunchairs and charcoal barbecue. A mechanic roll up awning/overhang can cover half of the terrace. We were a group of six who were lucky enough to spend two weeks in this lovely home in the village of Radicondoli. Everyone had their own room and bathroom and that still left a couple of spare bedrooms and baths. Two large livingroom spaces and a large terrace overlooking the hills of Tuscany. We loved the homey kitchen with 2 sets of windows overlooking the comings and goings of townspeople as they carried on with their daily lives. The home had everything we needed for our stay. In the town we tried the three retaurants as well as the bake shop and bar. (great cappuccino's) You really do need a car to explore the area but there are lots of charming towns and villages to visit. Very relaxing and staying here gives you a taste of true Tuscan living. Thanks Elena! The Tuscany of your dreams! I spent a week in Radicondoli with my girlfriends from grade school. The house looked fabulous on the website but the reality was even better. The house was smack in the middle of the most charming village we visited while in Italy. Its the real deal - not touristy but with enough going on (restaurants, agritourism, etc) to make it the perfect base but you really need a car to fully explore the area. The house was significantly bigger than we thought so we all had our own rooms. There were two salons to relax in and every possible convenience. The house was almost 1000 (yes I said 1000 years old) and although updated with great bathrooms, it has kept the feel of a gorgeous ancient noble home. The house was extremely well stocked with glasses, dishes, pillows, blankets etc and was beautifully furnished. We spent most of our time on the large terrace upstairs just loving the views. We wanted a true Tuscan experience and (wistful sigh) that was what we had. It was non-stop pinch me moments! The pool was adorable & tiny but because we were so busy we only used it once but it was great. We became part of village life and that was the best part of the holiday. We would have croissants and coffee at the bar down the road in the morning and would stop by for drinks prior to going out for dinner. We visited all three of the restaurants in town (some more than once) & the food was great every time. After 6, the town comes to life with everyone out in the street visiting and children playing in the squares until 10 p.m. or so. We went horseback riding at a local stable (Tegoni Farms) and had a fabulous meal at the summer home of local residents who could not have been more gracious. We also had a dinner at a local sheep farm which was also a spectacular experience. We bought wine from the local organic winery and they also could not have been nicer. If you go; say yes to everything!! We visited many nearby town (San Gignamo/ Sienna/ Firenze) and enjoyed visiting but were thrilled we were not staying in the midst of crowded tourist havens. After Radicondoli we went on to stay in Firenze, Rome and Amalfi but they paled next to our experience in Radicondoli! The only reason I'm writing this review is because Elena was a great hostess (although we only saw her on check in & check out) and the house was so amazing. I really wanted to keep it a secret but if you're going to Italy, well you deserve the trip that I just had. "Une demeure du 12è siècle authentique et pleine de charme avec une vue à couper le souffle sur la campagne toscane dans un charmant village avec toutes commodités. Quelques produits d''entretien et de première nécessité pourraient dépanner. Nous avons adoré notre séjour! Merci à la propriétaire qui nous a attendu très tardivement." Même si quelques commerces manquent sur le village et qu''il faut grimper 2 escaliers pour accéder depuis la piscine a la terrasse et sa vue panoramique magnifique"
"Dimora molto bella situata in un paese davvero grazioso, ottima per vivere qualche giorno all''insegna del relax. Una menzione particolare la merita il custode P., persona davvero gentile e disponibile." (Text automatisch übersetzt) Beim Kontakt mit dem Besitzer, werden Sie alle Informationen, um Radicondoli und das Haus so einfach wie möglich zu erreichen gegeben werden.